The following illustrations show the 3 different variations on EGR setups - 1bbl, 2bbl, and 4bbl carbs. (Use the 2bbl V8 one for the 3.8L V6.) In each there are colored lines that direct you to the column to use in order to find the gasket. However, I'm not 100% sure I have it right in the case of the 4bbl carb'd engines. At first blush it would appear that the gasket between the carb and heat shield would be from the column marked "CARB. TO HEAT SHIELD". However, there are no instances where a "1" shows in that column, so that can't be right. And, given that there are 3 gaskets in the stack and three "1's" in the other columns, I believe it has to be one of those. 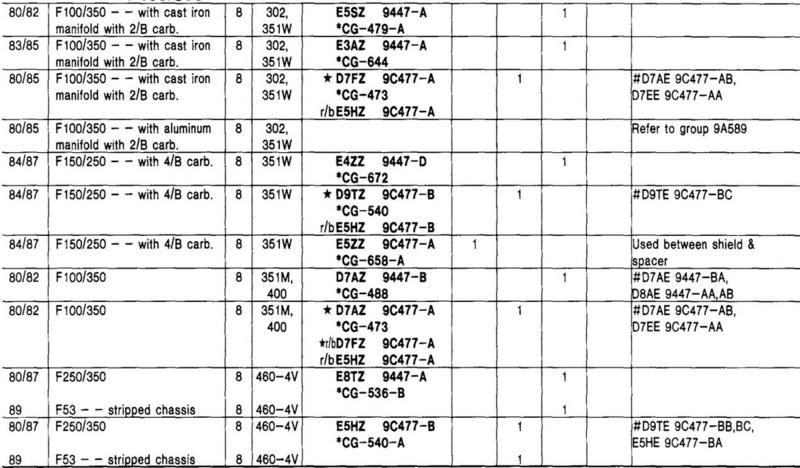 The catalog shows that the one from the "CARB TO MANIFOLD" column is to be used between the shield and the spacer. So, if the one in the "SPACER TO MANIFOLD" column is correct, then deduction says the only one that can be correct between the carb and heat shield is the one in the "CARB TO SPACER" column.